These are downloadable document files. Information about exhibiting at the Center for Creative Leadership. Participating members PLEASE read this letter carefully. Please note this is the 2015 form regardless of the file title! A summary of the participant responses to the 2016 Studio Tour Survey. Form for signing up businesses supporting the Extravaganza. All Extravaganza participants are asked to find ONE local business supporter for the event. This form should be used to register supporters. Please print it out as needed. 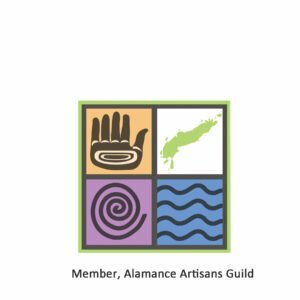 This is a contact list of current Alamance Artisans members, as of March 2017. This list is for personal use only for the purposes of networking with your fellow AAG members. This is an Excel Spreadsheet. This is the 2018 most current list of members with phone numbers. This is a contact list of current Alamance Artisans members, as of July 2015. This list is for personal use only for the purposes of networking with your fellow AAG members. Bullet-point instructions for members on using this Website, including posting instructions and contact people. The By Laws of Alamance Artisans, a non-profit member organization of the Alamance County Arts Council. The 2005 version was amended in April 2013 to revise the Standing Committee structure. This is an excerpt from a copyrighted pamphlet, ‘How to market your art”’ by Jude Lobe. It is offered for free to Alamance Studio Tour participants. Please do not give out to those not on tour. From a presentation by Christie Minchew and David Taylor at the 5/16 members meeting. It covers how the Orange and Chatham County Arts Guilds operate. This downloadable PDF tells you what you need to know to submit your images and info to be included in this website. This is a Word doc detailing the tasks involved for the various Studio Tour Committee positions.